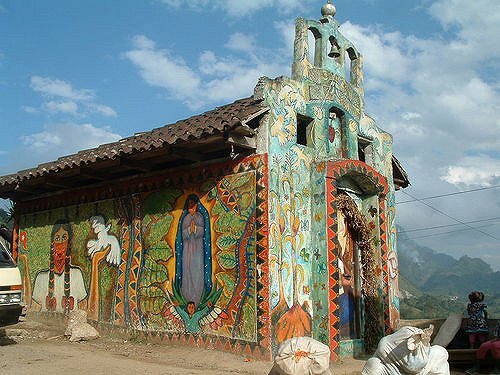 Zapatista Church: a very small monument to liberation theology. Credit: Flickr/David Sasaki. CC BY-NC 2.0. This June saw the passing of two of our generation’s most fascinating and controversial Catholic priests: François Houtart and Miguel D’Escoto Brockmann. Houtart was a Jesuit priest and prolific scholar on the faculty of sociology at the University of Louvain in Belgium. His leadership in the dialogue between Marxism and Christianity, his research on religion in society from Sri Lanka to Nicaragua, and his desire to connect social movements in the global South through the Tricontinental Centre (CETRI) which he founded in 1976, matched his academic output of some 50 books. On the theological front, he assisted in drafting the Pastoral Constitution of the Church in the Modern World (Gaudium et Spes or “Joy and Hope”), one of the most influential documents of the landmark Second Vatican Council. Houtart was a hero to many around the world but certainly no saint. In 2010, he terminated a global campaign to nominate him for the Nobel Peace Prize when he admitted to sexually abusing an eight-year-old boy in 1970. He is perhaps best remembered for his pioneering work on the analysis of, and resistance to, corporate economic globalization. Noting the pervasive influence of the World Economic Forum, he proposed the “Other Davos” in 1996, a counter movement against the mounting power of neoliberal economics. Five years later, others including Chico Whitaker, a lay Catholic activist and secretary of the Commission of Justice and Peace of the National Conference of Bishops of Brazil, built on Houtart’s initiatives to launch the World Social Forum (WSF) in Porto Alegre, an annual meeting place for alter-globalists seeking solidarity under the banner of “Another World is Possible!” Houtart served on its International Council. Miguel D’Escoto served as a Maryknoll missionary priest in his native Nicaragua after his education and ordination in the USA. A liberation theologian, he joined Nicaragua’s Sandinista movement (FSLN) in the overthrow of the dictatorial Samoza regime and its resistance to the US-led “contra” war, serving in the Sandinista government—including as Foreign Minister between 1979 and 1990. In 2008 he was elected president of the United Nations General Assembly. Though never entirely repudiated by the Vatican for his political work, he was suppressed for decades before being fully restored to his pastoral duties by Pope Francis in 2014. Houtart and D’Escoto were both men of their times. In their generation, liberation was in the air through national movements against colonialism, through revolutions, and through New Left activism across the globe. Following Vatican II’s “opening to the world” and the Church’s fresh engagement with modernity, Catholic priests, missionaries and lay leaders were free to pursue novel forms of ministry. This movement spread powerfully through Latin America—and with assistance from Houtart and others, in Asia and Africa as well. But the epicenter was Latin America, where the movement aligned itself with other civil society groups in opposition to right-wing military dictatorships. Among this generation, Roman Catholic theologians Gustavo Gutiérrez (now aged 89), Leonardo Boff (78) and Jon Sobrino (78), and the Methodist José Míguez Bonino (who died in 2012) are among the better known liberationists. Many of their ideas were developed in association with Paulo Freire (who died in 1997), the Brazilian Christian educational activist, proponent of popular education, and author of the acclaimed Pedagogy of the Oppressed. Why did this generation rise to prominence in Latin America? There are numerous reasons. For one, in the post-World War II period, some like Houtart in Belgium were radicalized by the plight of the European working class and challenged by its irreligiosity to find new ways of articulating and identifying with the poor. This experience spread to Latin America almost accidentally, for the simple reason that Europe was oversupplied with priests and Latin America needed more of them; knowingly or not, Latin America imported radicalized priests in significant numbers. Latin American priests also studied in Europe, absorbing radical thinking. These influences played out in societies dominated by the Catholic faith. But the larger reasons were twofold: first, the abject poverty of the Latin American majority which even the Vatican could no longer overlook; and second, the rise of oppressive military regimes and bitter political revolutions in Brazil, Argentina, Chile, Nicaragua, El Salvador and Guatemala. The felt need for liberation among the poor, the marginalized and indigenous peoples was as palpable as it was necessary. From the 1960s through the 1980s, the struggle for liberation was very real. Those days are gone. Democracy has returned to much of Latin America, as well as a more pragmatic form of social democracy, and liberation theology has lost some of its revolutionary raison d’être. In his open and honest postmortem on the movement, the Belgian-Latin American José Comblin (who died in 2011) admits that in many ways the liberationists misinterpreted the life experience of the Latin American poor. Hence, liberation theology was but a moment. It was a particular theo-political response to a specific set of circumstances—a generation’s rebellion against grinding poverty in the killing fields of revolutionary Latin America. But the rich theology of the liberationists endures as a challenge to every church tradition. Their analysis of the causes of poverty and how it is structured into prevailing global systems—recently articulated by Houtart in his 2011 manifesto From ‘Common Goods’ to the ‘Common Good of Humanity’—challenges every church to open its eyes to the cold, hard analysis that’s required to grasp the changing world around them. Is there anything else the rest of the world can learn from the liberationists? In the West, the Protestant, Anglo-European North and the Catholic, Iberian South produced vastly different socio-political traditions, even though they share in common a white settler history of slave-holding, the suppression of indigenous peoples, and capitalist class exploitation. If the South trends social-democratic and struggles against powerful conservative elites, the North trends liberal, towards laissez faire capitalism and expressive individualism. As it was framed in Latin America, liberation theology could never succeed in the North. Nevertheless, it has many lessons to teach. The first lies in its consciousness—its willingness to flip the social script from catering to elites to privileging the poor. Liberation theology was never only about theo-politics and revolution. It was also about overcoming alienation: the alienation that separates human beings from each other, people from the Earth, Western from pre-Western forms of life, and alienated psyches from transcendence. It taught ordinary people to perceive the reality of their own circumstance—to conscientize themselves, as the liberationists put it—through their own self-reflection, so that they were free to construct a social reality that resisted the powers of the age. Secondly, we can learn from its methodology, simple yet profound: “See–Judge–Act.” That is, live in the concrete world. Describe reality as it is, not simply as theory tells us. But also judge reality from the horizon of a reconciled humanity, and act accordingly to bring that reality about. The liberationists put a lot of time into analysis, and that let them tell, in great detail, the hard truth that the world we have made is grinding others into the dust, and that this must stop, as much for our own salvation as for the wellbeing of others. Third, we might even learn from its mistakes. To overlook popular religiosity—because intellectual and religious elites aren’t interested in the daily lives of the faithful, or because wealthy city dwellers forget rural life and laugh off its traditions, or because the successful classes denigrate the struggling classes and blame them for their own suffering—is to leave large segments of society without the material, intellectual, and spiritual resources to find their way in the world. Lastly, we might learn to take our own churches more seriously. The liberationists believed in spiritual community, life-giving fellowship, and historical church structures to hold them together more than any religious movement that I’ve come across. They believed in a “new way of being church”—confident that the social power of faith can liberate societies as easily as it can oppress them. Since the end of Soviet-style socialism in 1989, ‘alter-globalization’ rather than ‘liberation’ has come to define the radical imagination, but the problems of poverty and oppression persist—as does the possibility that we might draw again on the theo-political resources provided by a remarkable community of radical priests to inspire a new generation of alter-globalist activists and theologians.